This is an annotated bibliography of horticulture resources in California. Horticulture is a branch of gardening that overlaps with many topics: botany, agriculture (plant cultivation and related sciences), food science, and landscaping. Even fields like history, medicine, and economics influence horticulture. While known for its Mediterranean environment, California also hosts a wide variety biological zones: coastal, alpine, prairie, desert, and chaparral. These multiple climates offer a wide horticultural range—for native as well as introduced (non-native) plants. This guide is aimed at librarians in academic libraries or special collections. The primary patron audience is post-secondary students, with a secondary audience of researchers and advanced garden enthusiasts. Scope: This bibliography excludes nurseries, suppliers, and seed banks. It also does not comprehensively list of gardens, websites, organizations (e.g., gardening and botany associations), and journals—some are mentioned, but such a listing would be more appropriate for a patron pathfinder rather than a bibliography aimed at librarians. However, this bibliography will guide you towards more information on such resources—to help in collection development—as well as to develop subject guides, expand your knowledge, and improve patron services. This site has five pages. The three resource pages list items in alphabetical order according to resource title or name. Books: Books and print encyclopedias. Subscriptions: Resources that generally require paid subscriptions, such as databases, online encyclopedias, and journals. Organizations: Websites for academic and professional associations, along with herbaria, arboreta, and other botanic gardens. Several of these offer free database or OPAC access. Contact: About the author and a contact form. arboretum (pl. arboreta): A type of botanic garden specializing in woody plants like trees and shrubs. Nowadays arboretum as a term often used synonymously with botanic garden. botanic garden (a.k.a., botanical garden): A garden specializing in the display of plants to study and illustrate taxonomy, cultivation, and botanical uses and/or history. cultivar, botanic variety, hybrid, and subspecies: A variety is a more formal taxonomic name in botany for a specific plant species (Ceanothus megacarpus var. 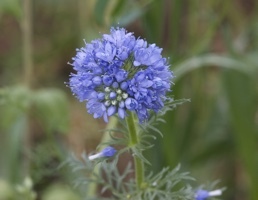 pendullus—a variety of ceanothus); but a subspecies is term that is less biologically specific than variety, yet more specific than genus plus species alone (Lupinus bicolor subsp. 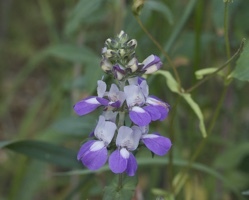 tridentatus—a subspecies of lupine). By contrast, a cultivar is used more in horticulture and agriculture to designate a somewhat less formal group of plants (Eschscholzia californica 'Alba'—white California poppy cultivar)—usually propagated rather than found in the wild—that are selected for particular physical characteristics (flavor, color, shape, size, etc.). Finally, a hybrid is an organism that results from crossing different species (Halimium x Pauanum—a.k.a., yellow sunrose). flora: A botanical identification guide, often utilizing an identification key. herbarium (pl. herbaria): An archive (special collection) of physical plant specimens. Many herbaria have digitized images for easier online access for people who cannot visit in person. identification key: A tool used in biology (and other sciences) to help in identifying species by guiding the user through a series of identification steps; this typically involves familiarity with morphology (physical traits), and is often organized taxonomically. taxon (pl. taxa): A grouping of organisms at a particular taxonomic level, such as kingdom, phylum, class, order, family, genus, or species. In botany, families—whose names end with a -aceae suffix—are a common taxon by which plants are categorized. type specimen: An example organism, such as a plant or animal, which ideally typifies the biological characteristics (morphology, color, etc.) of a given species. The Library of Congress SB subclass for Plant culture encompasses horticulture, gardening, and other relevant topics. You can also find some horticultural resources under the QK subclass for Botany. The Library of Congress Classification Outline is rather long, but you can view a PDF or Word version for the S class on Agriculture, and a PDF or Word version for the Q class on Science. Dewey Decimal Classification uses 635 for horticulture and gardening. On the subject of gardens themselves, 712 is helpful for particular gardens, as well as landscape design and architecture. Additionally, refer to the geographic and travel subclasses in 917 when seeking gardens in California and the Western US, or the classes in 58x for botany. Liberman, S. (2009). 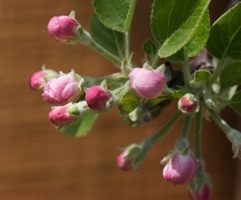 Globe Gilia, Braeburn apple blossoms, Chinese Houses. Retrieved from Botany gallery | Liberman.